Product prices and availability are accurate as of 2019-04-25 22:57:34 EDT and are subject to change. Any price and availability information displayed on http://www.amazon.com/ at the time of purchase will apply to the purchase of this product. You pay for what you get! 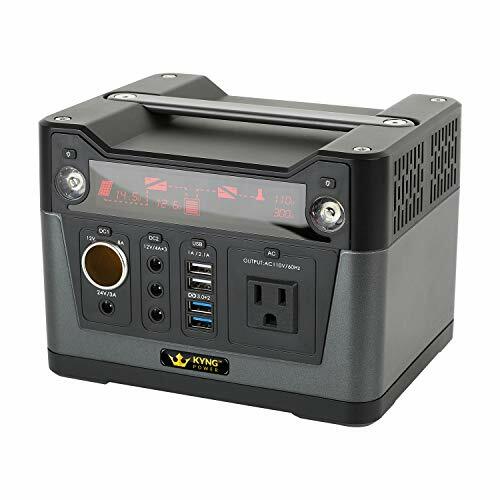 Kyng Power Portable Power Station Solar Generator is ranked #1 Seller for a reason! It works! Its reliable! Its 100% guaranteed! The Premium Kyng Power Portable Generator is silent, mobile and produces safe, clean power. 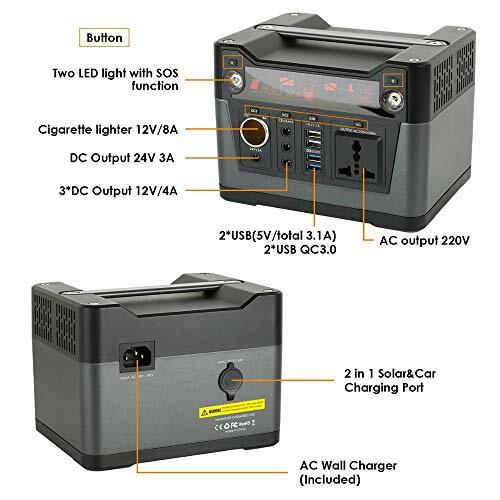 This solar generator can be charged by 12v/24v car charger (car charger included), AC wall adaptor (included) or a solar panel (panel sold separately). We INCLUDE a FREE set of Solar Panel Cables (MC4 cable). On Line UPS -- Battery power supply surge protection for desktop pc, laptop, workstations, networking devices and home entertainment systems, emergency power to lamps, lights, cell phones and small devices up to 300W. Safeguards valuable documents, photos, videos, and music files, playstation from loss or damage due to power outage. Perfect for camping or outdoor excursions. Versatile Outputs and Mini Size -- Pure-sine wave inverter, 1 three-prong 110V receptacles (for devices up to 300Watt/0.67Hp), 3 DC 12V ports, 4 USB ports, 2 1W Led flashlight, DC cigarette outlet, emergency power generator around you! Just weighs 8LB. If charging with solar panel, only use one panel 60w to 120w 18v. The unit will reach full charge and display 12.6V. Low battery will come on when the display shows 9.6V, it will alarm and when shows 9.0V outputting, it will stop. Takes approximately 6-7 hours to fully charge from house outlet if depleted, 10 hours from car adapter. If not using for long periods of time, charge the battery fully every other month. Yes, it can be used in your home, outside or wherever your needs take you. EVERYTHING YOU NEED---Versatile Outputs and Mini Size -- Pure-sine wave inverter, 1 three-prong 110V receptacles (for devices up to 300Watt/0.67Hp), 3 DC 12V ports, 4 USB ports, 2 1W Led flashlight, DC cigarette outlet, emergency power generator around you! Just weighs 8LB. GUARANTEED---100% Guaranteed or your money back against manufacturer defect. 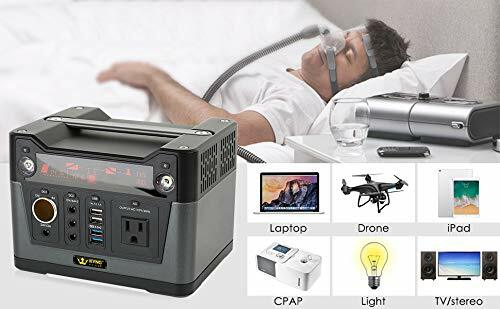 #1 Ranked Portable Power Station Solar Generator ON-LINE UPS---Battery power supply surge protection for desktop pc, laptop, workstations, networking devices and home entertainment systems, emergency power to lamps, lights, cell phones and small devices up to 300W. Safeguards valuable documents, photos, videos, and music files, playstation from loss or damage due to power outage. Perfect for camping or outdoor excursions. 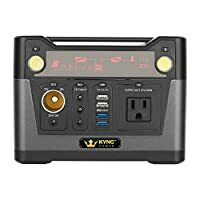 EASY TO CHARGE+FREE CABLE---The Premium Kyng Power Portable Solar Generator is silent, mobile and produces safe, clean power. 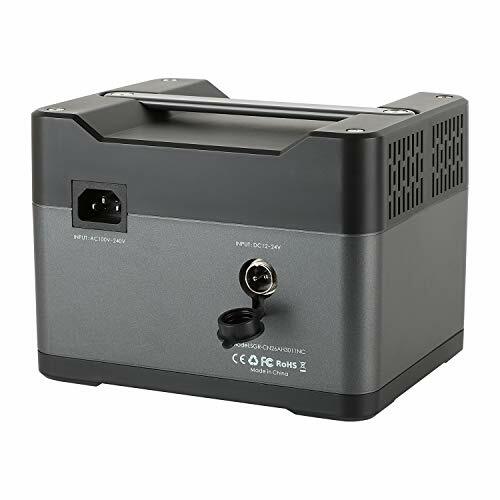 This solar generator can be charged by 12v/24v car charger (car charger included), AC wall adaptor (included) or a solar panel (panel sold separately). We INCLUDE a FREE set of Solar Panel Cables (MC4 cable). PORTABLE+MOBILE+EASY---Super easy to charge and bring with you to any occasion. Must have for emergencies and any indoor or outdoor activity you can think of.